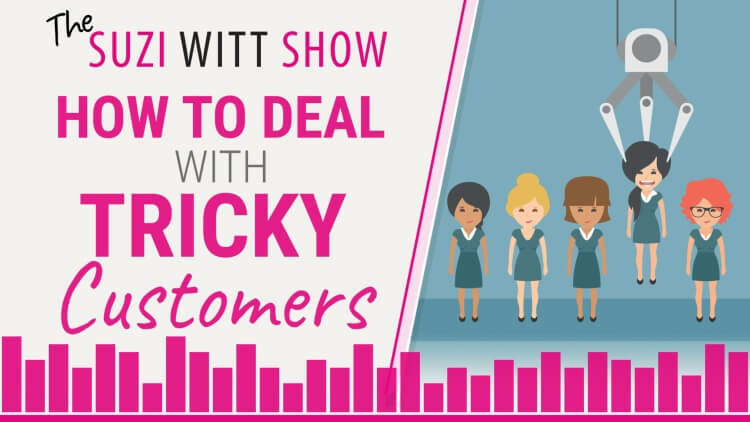 In episode 19 of the Suzi Witt Show, I am addressing the difficult topic of tricky customers and how you manage them. This often means taking some hard decisions but as long as you have a clear plan and are consistent, fair and reasonable, you can put in place strategies for dealing with customers who surprise you. Listen in this week to find out 5 types of customers and the two main methods of dividing your customers and managing them. Find out 5 types of customers and how your approach can change according to the type of customer. Learn the two main methods for dealing with customers. Learn the different between PUFF and PUSH principles for dealing with customers. Understand when you have to let a customer go. Learn why some customers are not really customers you want. TSWS: 018 Dealing with analysis paralysis in your business. TSWS: 007 The backstory of a $7 figure business and the lessons I learnt.